Just one of the articles from Pet Care Pro Quarterly, IBPSA’s digital magazine for pet care services professionals. Read the current issue online here. Jamie Migdal, CPT-KA, founder and CEO of FetchFind, a staff training solution for pet care businesses, is well-versed in what it takes for pet care businesses to grow and sustain a team of qualified pet care professionals. In past issues of Pet Care Pro Quarterly (see articles footnote), Jamie has addressed unique and innovative ways to find pet care professionals and how to make the tough and smart decision to fire. 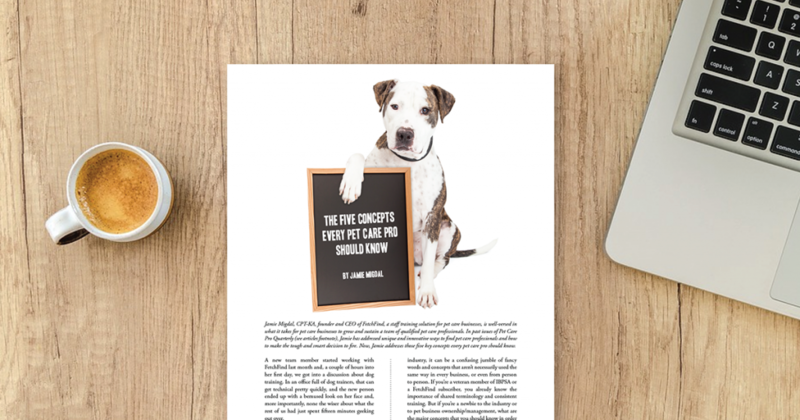 Now, Jamie addresses those five key concepts every pet care pro should know. A new team member started working with FetchFind last month and, a couple of hours into her first day, we got into a discussion about dog training. In an office full of dog trainers, that can get technical pretty quickly, and the new person ended up with a bemused look on her face and, more importantly, none the wiser about what the rest of us had just spent fifteen minutes geeking out over. That got me thinking about the professional terminology that we toss around and don’t think twice about. But to someone who is new to the industry, it can be a confusing jumble of fancy words and concepts that aren’t necessarily used the same way in every business, or even from person to person. If you’re a veteran member of IBPSA or a FetchFind subscriber, you already know the importance of shared terminology and consistent training. But if you’re a newbie to the industry or to pet business ownership/management, what are the major concepts that you should know in order to function effectively in your role? Based on a poll of my in-house team of pet care professionals, here are the top five concepts that every pet care business owner, manager, and employee should know. It’s all about timing, consistency, and motivation. Timing. Dogs live in the present. They have about 1-2 seconds in which to associate a cause with an effect. So, a dog will believe they are being rewarded or punished for what they’re doing at the moment. That means your timing should be on point. Consistency. There is no gray area for dogs, so your training must be clear and consistent. This means the words, hand signals, and rules should be the same for everyone interacting with the dog in order to reduce confusion and frustration on both sides. For example, if you don’t want a dog to jump up on you, don’t allow it only when you’re in a good mood. When dogs know what to expect, they feel safer and less stressed. Motivation. Without motivation, there is no behavior. Think of it this way: reinforcement makes a behavior more likely, and punishment makes it less likely. The behaviors you reward will occur more often, and your praise or rewards must be meaningful enough for your dog to strive for them in the future. For example, if a dog does not like to be touched and your reward for doing something correctly is petting, that isn’t a positive for that dog. Make sure to use a reinforcement your dog responds to. Your corrections need only be enough to decrease or extinguish a behavior that is undesirable. Catching and reinforcing Fido doing the correct behavior is the most effective way to train. Think of it as the pet care version of the Hippocratic oath: first, do no harm. What you need to know – The humane hierarchy of procedures helps guide pet care professionals through the decision-making process for training and behavior modification. The humane hierarchy starts at the most positive and least intrusive effective intervention strategies. The International Association of Animal Behavior Consultants (IAABC) presents a complete “Hierarchy of Procedures for Humane and Effective Practice” on their website. (See https://m.iaabc.org/about/position-statements/lima/hierarchy.) Even veteran dog trainers and behaviorists can struggle to remember the minutiae of the humane hierarchy, but if you remember the acronym LIMA (“least intrusive, minimally aversive”), you won’t go wrong. Dogs (and all animals) can be taught just about any behavior with the use of humane teaching methods. What you need to know – You know that phrase “don’t rub his nose in it”? That dates back to when we potty trained puppies by rubbing their nose into the pee puddle or poop pile whenever the humans discovered it in the house (no matter how much time had elapsed between excretion and discovery). We’d be shocked to see someone do that now, of course, because animal behavior theory has clearly demonstrated that the best way to achieve lasting desirable behavior is by positive reinforcement methods. Praise and treat the puppy immediately when he does his business outside. If he goes inside, you clean it up, figure out what you did to miss the cues, and do a better job next time. I am always, always surprised and delighted at how well and quickly positive reinforcement works. If you can train a hippo to allow his teeth to be cleaned (check out the video “Hippo Agreed on Teeth Cleaning: Amazing” on YouTube), you can train a dog to pee outside without the use of painful or frightening techniques. Dogs have hard-wired behavioral patterns that have been bred into them over the centuries by humans who wanted these characteristics available for the performance of certain tasks (such as hunting or herding). What you need to know – Learn the major behavioral characteristics of each breed group. Not every dog will display a pure form of the behavior but knowing that a dog is a Terrier mix or a Hound mix can help you to understand why they do what they do. Once you know that, you will be much better equipped to work with them in ways that set them up for success. You can’t expect a Beagle to stop following his nose, but you can keep him on a leash so that he doesn’t follow his nose into the next county. This theory holds that dogs are like wolves and therefore we (as humans) should be the leader of the pack and assert our dominance over them by techniques such as alpha rolling or hand-biting their necks or shoulders. What you need to know – Dogs aren’t like wolves, and techniques like alpha rolling are a fast track to a nasty bite and all sorts of other unwanted behaviors. The (thankfully waning) popularity of dominance theory and pack leadership is due to several factors, but I think that part of the initial acceptance of it was because the concept is easy for humans to understand, no matter how misinformed or dangerous it really is. In a nutshell, dominance is a discredited theory that no responsible pet care professional should be purveying or practicing. It’s dangerous, outdated, and unnecessary. What are the “Big 5” concepts that you think every pet care pro should know? Tell us at hello@fetchfind.com. As part of IBPSA’s new “Premium” membership option, members of IBPSA have on-demand access to 100+ professional, high-quality educational online programs prepared for IBPSA by the pet care industry experts at FetchFind. This new membership option also means no additional costs for your employees to access this education. All available online 24/7 in the Online Education Center through the IBPSA members-only dashboard. For more information, visit https://www.ibpsa.com/premium. The Seventh Annual IBPSA Pet Care Services Educational Conference & Trade Show happens October 1-3, 2019, in Palm Springs, CA. Early Bird rates now in effect. Join us! Nominations for Pet Care Business Excellence Awards Now Open! New Issue of Pet Care Pro Quarterly (Q2 2019) Unleashed! Is Your Pet Care Business Sustainable? Join our email list. Stay up with the latest pet care services industry and IBPSA news.